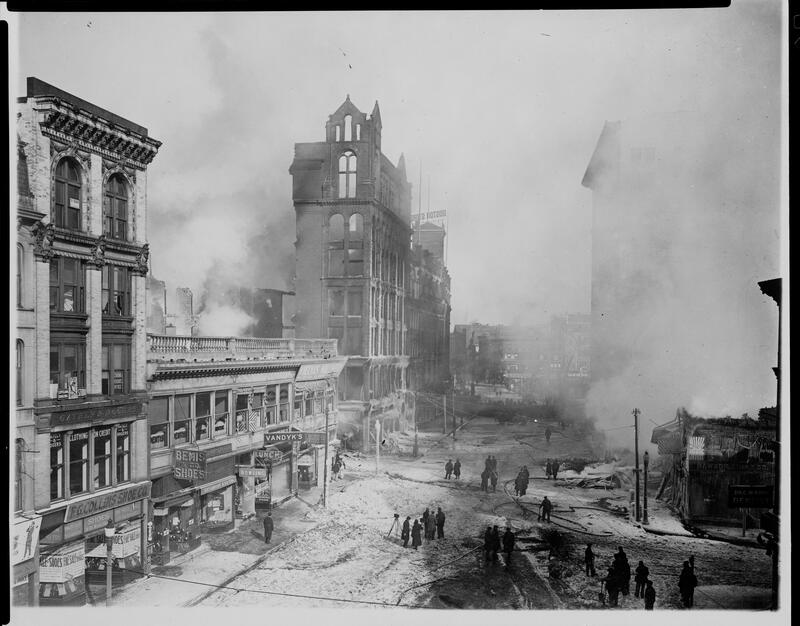 Box 4 Special Services was established in 1921 when a major fire broke out along Main Street in the City of Worcester on January 19th. The temperature that night was said to be around 10 degrees below zero. A group of Main Street businessmen banded together to provide warm drinks and blankets to the firemen due to the extreme cold. The group organized into what would become known as Box 4 Special Services. Telegram and Gazette “Then and Now” Feature on the fire. This group continued this service until sometime in the mid-1960’s. Historical research suggests that this service was merged into the Worcester Auxiliary Fire Department before that disbanded as well. After some research, Favulli and Bongovio along with a group of firefighters banded together to investigate getting a canteen unit started in the city of Worcester. One of the first issues – what do we call ourselves? President Favulli made the suggestion of bringing up the old name – Box 4 Special Services. It stuck. Later that year, the snowball was rolling downhill and growing quickly – Dunkin’ Donuts announced they were donating a brand new truck, Paul Davis Restorations donated a Sprinter ambulance for us to use, and Shrewsbury Fire took the Sprinter in and with the assistance of some of our members, converted it into our Canteen 2. The City of Worcester and IAFF Local 1009 agreed to have voluntary payroll deductions. The Leary Firefighter’s Foundation stepped up and offered to not only cover one of our largest planned expenses – insurance, but to also purchase two-way radios for our use. While the Dunkin’s truck was in the process of manufacturing, it was announced that we were officially credited as a 501(c)3 non-profit. In May of 2013, we took delivery of Canteen 1 and held an unveiling ceremony at Worcester Fire Headquarters. At the same time, we were technically homeless – we had no place to store the vehicles permanently. 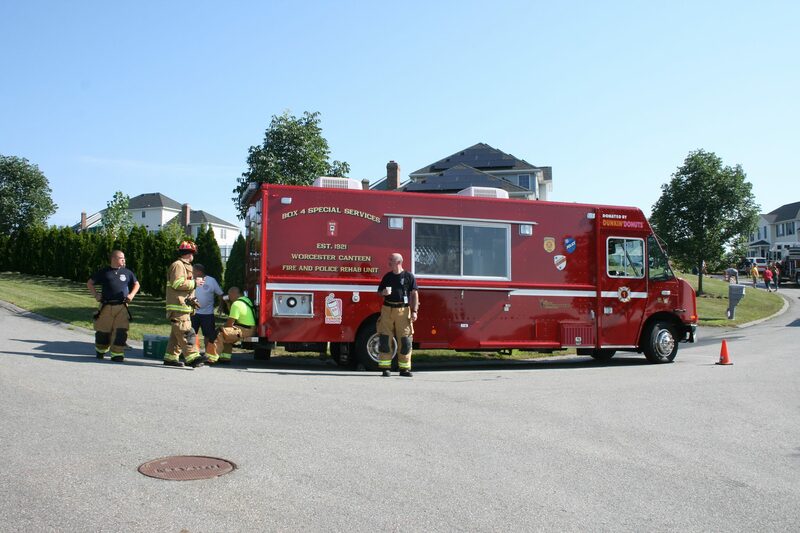 Canteen 2 was in Shrewsbury for its conversion, but Worcester Fire had no available space for a 12′ ft. tall, 30′ ft. long, custom made Canteen unit. After talking with several in the local public safety networks, an unexpected offer came forward, from an agency critical to public safety in Worcester – Worcester EMS. WEMS offered us garage space for Canteen 1 and some storage space that they could afford to let us use. To this day, Worcester EMS has been a great host, and both WEMS and Box 4 Special Services enjoy a great working relationship. While everything was still getting put together in the summer of 2013, Box 4 received its first request for a response. Rutland experienced a structure fire on July 17th and command requested our response if we were available. This was Box 4’s first run since the organization disbanded back in the 1960’s. That summer, we received a grant from Homeland Security to purchase a brand new refrigerator, freezer, and ice machine. After that response to Rutland, we marked ourselves as “unofficially” available for calls. In November with the ice machine installed at Worcester EMS’s garage, we officially went into service at 0800 hours on November 4th, 2013. Since that morning in November 2013, Box 4 has responded to calls from as close as a 1/2 mile away to 55 miles away. We are proud to continue the legacy of Box 4 Special Services and look forward to many years of service to the public safety community in Central Massachusetts.